Let me start off by saying that this isn't really my kind of movie. I guess the real reason that I went to see it was to see something different...and possibly to prove my manhood by watching something violent. And Fight Club is definitely different, violent, differently violent, and violently different. What is disturbing (better word, huh?) about this film is the fact that it not only glorifies violence, self-destruction, and vandalism, but that it also interjects a sick and twisted sense of humor. There were a few times that I almost found myself laughing, as the rest of the audience was, only to stop myself and realize the horrible thing that was somehow meant to be funny. Some of the humor was indeed funny, but, as I have mentioned, some of it was just sad. And speaking of the audience, it was interesting to note as well. It consisted, primarily, as expected, of young adult males, of a somewhat rough or crude exterior (as they walked down the aisles, you could smell them before you could see them). But what was also interesting was that there were a few couples there on a romantic date. HAHAHAHAHA! One really weird thing is that this movie uses subliminal images. Somehow I thought that this was outlawed or something. But sure enough, several times I saw, for a split second, the image of a man in a red coat or something (probably Pitt as Durden in the picture above). 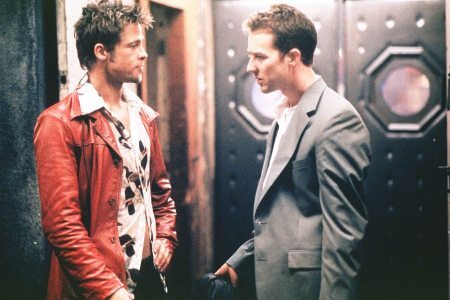 And to make sure that we catch the ones toward the end of the film, the plot of the story points this technique out to us as Tyler Durden (Pitt) demonstrates just one of his ways of wreaking havoc on society. My main complaint with this movie is the fact that it took the single most horrifying thing possible to a man, and exploited it (nay, abused it) not once, not twice, but three times! I refer, of course, to the (I must use a metaphor to mitigate the shock, pain, and fear) threat of the robbing of the family jewels. To its credit, however, the movie could have done even worse, I suppose, in which case I would boycott 20th Century Fox for the rest of my life. A secondary complaint that I have with the film is the ending. On paper, I am sure, it looks good: boy holds girl's hand and watches from skyscraper window as all other skyscrapers in the city collapse and fall, one at a time, according to boy's design. But man oh man (or should I say, boy oh boy?) did it ever look stupid on film! It was SO UNBELIEVABLY FAKE! I guess this movie is not a "special effects" movie, but still, it should have invested a little in the final scene. The only effects that this movie DID do well with had to do with blood (unless it was all real!!!). There was blood everywhere in this movie. My final complaint is in how much of it is corny. Such as the title. And in the rebel commando group "Project Mayhem". That is about as corny as you can get. But then there is also "The first rule of Fight Club is...The second rule of Fight Club is...The...". That was really, really corny. But even after all of these complaints, the fact remains that this movie is actually very well made. The plot is intricate, the acting is not bad, and the violence is believable and shocking, as it is intended. Meat Loaf was also pretty good as Robert Paulson, or Bob (left), whose death was meant to wake us all up so that we realize that Tyler and his gang have gone too far. However, this point may have somehow been missed. What is really intriguing and surprising about this film is that it has a plot. I guess I was expecting just a bunch of fight scenes (like Blood Sport), but there are two main focal points of Fight Club. First of all, there is the insanity of the dual personality of Tyler Durden. It is quite reminiscent of Jekyll & Hyde. What is somewhat disturbing is that the movie hints that this is an almost inevitable result from our material, success-driven society. It is also interesting to note the amount of movies out there today that take a look at dissatisfaction in the workplace (American Beauty, Office Space, Jerry Maguire, etc.). Do we really hate our jobs? Or does Hollywood just look at us like we are all losers, working away at a desk like rats in a cage? The second main focal point looks at the flock of "lost" men who find strength and purpose in blindly following the crazy Tyler. They become completely mindless, forever repeating Tyler's rules. And what is scary, I suppose, is that this sort of thing could actually happen (just look at the Nazis or skinheads or militias or any of your local cults). As to its beginnings, with just a group of guys meeting to fight, this is actually pretty popular nowadays. It's called Ultimate Fighting, and I know several people who like to attend these things. I've even met someone who fights at them. But their motives are for money and self glorification. The men in Fight Club seem to fight for self-destruction as they yearn for an escape from their crappy lives. And what is even stranger to consider is: just what exactly was this movie trying to do? On one hand, I can see how it was mocking and attacking society in how we are held captive by our material possessions. But on the other hand, it seemed to show the silliness of dealing with life's problems via violence and destruction; either that, or to promote such behaviour (I am not quite sure on this one). Somehow, I can see people all over the nation walking out of the theater, and, turning to their friends, saying, "I want you to hit me as hard as you can." Oh, and there was a lot to do with soap. I would recommend it only to those who can take it (women and children should avoid it, I guess), just for the fact that it is so different and has a different look on life. How would you rate the movie Fight Club? There have been 25584 people to visit this page since Sat, Nov 27, 1999. And you are the first person to visit this page today!